I didn’t go with Jeremiah to the farm this morning. Partly, that’s because as he readily points out, I don’t do mornings. (That’s not entirely true, I just don’t do mornings as early or as well as he does.) Also, we were expecting Mr. Raccoon to be trapped in the live trap we set, and, while I know exactly what has to be done and why, I didn’t really want to be there to see it. 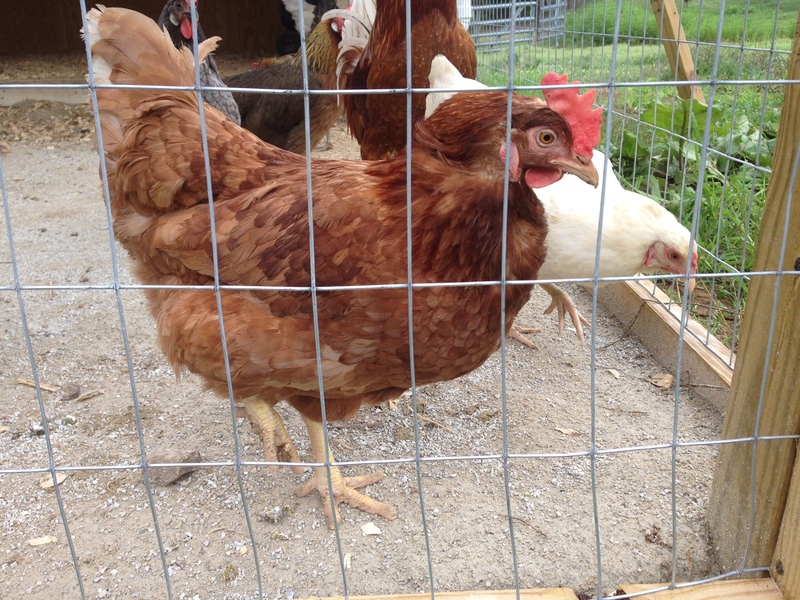 Recently, a friend was incredulous upon learning that I have no plans to eat my chickens. …I’m still not sure why. Why am I not one of them? For one thing, adding meat animals to my current menagerie would take up even more time. Time, for me, is at a premium. Also, they would take up space, also at a premium. The farm is not my job, it’s my home. I really don’t want to change that. Additionally, if it’s not clear already, I get attached to my animals. I’m not sure why I’d want to take on MORE WORK to raise slaughter animals when I know for a fact that it isn’t something I’d enjoy. Finally, while we’re by no means vegetarians, we really don’t eat much meat. To accommodate the meat-eating that we do, I have no problem paying a premium for local or independently certified humane meat. I buy my beef from family, and I’m still trying to work through the beef quarter I bought last fall! Just to clear things up, I thought I’d write a post about why I have chickens, even though I don’t plan to eat them. Some of my chickens have names. This one, for example, is Lucy. I thought about writing this as a list, but as I tried to start, I found that the reasons are fairly holistic. And, I realized, laying hens are not immune to the implications of factory farming. Not enough space, unhealthy conditions, and drastically shortened lives are the rule, not the exception. 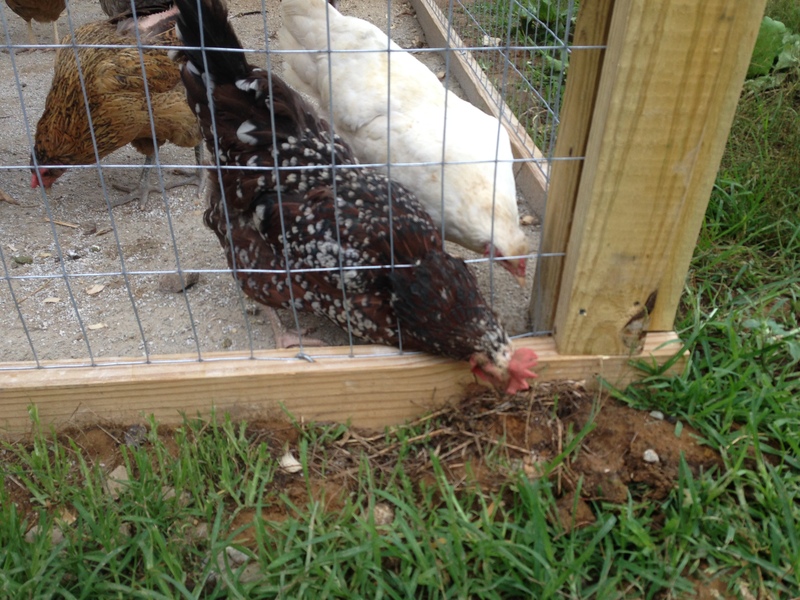 I knew I didn’t want to raise my own meat, but I knew I could handle raising my own laying hens. I now know EXACTLY where my eggs come from, and that’s rather lovely. Can anyone explain why it is people would take issue with all of this? Next I fought the farm and the farm won. People in this country have no problems with dogs, cats, and birds as pets rather than as human food, so I agree with you, why NOT chickens as pets? After watching yours, I, too, realize how funny they are and how each of the personalities are different. It’s also very relaxing to watch the interaction between the chickens. Maybe those folks consider relaxation to be sitting in front of a TV with a six-pack of beer. I do squats with kettle bells, run through the mud, and climb over eight foot walls. You watch your chickens. As long as it works, to each his own. I don’t know. There’s are reasons slaughter animals have numbers and not names; and there are as many reasons for not killing your livestock as there are for killing it . . . more, in my opinion. Especially since they have names. You should have seen them the other day, the whole flock was chasing one daddy-long-leg around Cluckingham. Hilarious. After I retire next month, the first thing I am going to do is get chickens and a dog. I guess that is the first and second thing. Not sure about eating them (the chickens that is) but I am sure about the eggs. I will eat them. The dog will come from an animal shelter. I am looking for the oldest, ugliest, most cantankerous mutt I can find. In other words, a kindred spirit. Just make sure the dog won’t eat the chickens, yard side massacres will ruin a perfectly good day. I know. The eggs are glorious, and there is nothing better than a good dog! Old dogs get passed over at shelters so much, so it’s excellent that you’re looking for a kindred spirit. It does actually make me feel better. I’ve had that comment from a number of directions, and usually it’s pretty respectful. (Oh, they’re pets? Alright.) But the other day, my friend kept trying to convince me that I should eventually slaughter them. I started to get really annoyed. Haha! So funny you posted this today , Cherity. Hubby and I were just out here reflecting on the upcoming cull of one of my young cockerels. He agrees with you entirely. All my 12 chickens are named and I consider them pets. It is a tough one…”wasting” a perfectly good young rooster (with a nasty bedroom manner, sadly). Hubs says leave him out for the kites. I say it is a waste, as he is only 4 months and perfectly good for food. Still, having said ask this, I still agree with Anna. I can not ever eat my laying hens. They work hard for their feed and deserve a long life. I can see the merit of culling a poorly mannered roo, but I agree completely on the laying hens. They work hard! My girls, and my current, exceedingly well-mannered roo, shall die of old age if I have any say in it. You have an odd idea of low maintenance. Cows are easier to raise than chickens. They poop everywhere, fight for the one nest everyone wants (even though they have many choices of nests), pick on each other for that nest. Did I mention they poop everywhere? At least llamas and alpacas poop in one community shared spot. Don, I don’t even want to know where that came from. Just call me a pooplogist. My chickens take so much less time and effort than my horses, or llamas, or dogs. (The cats are in fact easier…) If all I had were the chickens, I would have like, fifteen minutes of farm chores most days.